One of the best ways to present Messianic Jewish publications and resources in stores is to focus on the biblical Jewish holidays, including Passover, Pentecost (Shavuot), Rosh Hashanah (Festival of Trumpets), Yom Kippur (Day of Atonement), Sukkot (Tabernacles) and Hanukkah (Festival of Dedication). More Christians are discovering that these holidays, first mentioned in the Tanach (Old Testament), not only provide the background of many texts in the New Testament but also are enjoyable and educational. Yet finding books that explain them and the items used to observe them can be a time-consuming task. That’s where the Christian retailer comes into the picture. For example, during the month before Passover, as people start thinking about Easter, presenting a Passover seder (dinner) table shows the customer what items he would need to buy to experience a seder, which is not unlike Yeshua’s Last Supper. Imagine how a participant would feel when seeing how the matzah (unleavened bread) is handled during the meal. Three sheets of matzah are taken, the middle sheet broken in half and then “hidden” until the end of the meal. Some scholars believe this Jewish custom became part of the Passover ritual as a result of some first-century Messianic Jews adding it to their seder to reflect the story of Yeshua’s death, burial and resurrection. Even if that isn’t the case, the picture this ceremony paints is certainly moving. Considering “the cup after supper,” the third of four cups taken during the Passover meal, which Messiah shared with His Jewish disciples, makes the observance much richer. The fruit of the vine in that cup has deep meaning, connecting all the way back to the story of the Exodus, finding fulfillment in the sacrificial shed blood of Jesus. There are other elements of Passover that are meaningful to Christians too. I wrote and published The Messianic Passover Hagaddah, a book that has been widely used to guide Christians on how to set up and enjoy a Messianic Passover. Setting up a seder table in a bookstore enables customers to see what items they need to purchase to have their own Passover event. Hanukkah, the Festival of Dedication, is only mentioned in the Bible in John 10:22 and is a holiday often missed by Christians. Yet if Hanukkah hadn’t happened, it would have affected salvation history. Jesus was at the temple on this day, perhaps recalling the heroic acts of the Maccabees, the priests who led the overthrow of the Syrian Greeks who had desecrated the temple. It was the loyalty to and faith in God held by these Hebrew priests that gave them the courage to stand up against the oppression of the pagan attackers. I can see the Messiah meditating on the courage He would have to muster to fulfill His mission on earth. On Hanukkah, there would have been no better place to think about these things than the temple. Books have been written to explain the celebration from the New Testament perspective. I wrote Dedicate and Celebrate to explain not only why this biblical holiday is important but also how to observe it. Hanukkah menorahs/candelabras—called Hanukkiahs—make the celebration more meaningful. Lighting the eight candles each year is a great way to develop faith in God. A Hanukkah display in stores would attract customers so they could see which products are available. The Festival of Trumpets also is becoming more meaningful to Christians these days. Given that we are in the “last days,” and with so many references in the New Testament to the blowing of shofars, or trumpets, Christians have been exploring this ancient “instrument.” Based on the “ram caught in a thicket” (Gen. 22:13) that Abraham sacrificed in place of his son on Mt. Moriah, this item developed a meaning of its own. On Rosh Hashanah, we have many dozens of blasts on these horns, each serving as a warning of impending disaster, the way shofars were used in Bible days. 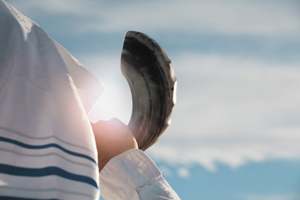 Jewish tradition ascribes other meanings to blowing the shofar—to announce a visiting king, to gather people to pray, to mark that a sacrifice has been made, to confuse Satan and to “remind” God to protect His people. Each of these meanings is relevant to the life and death of the Messiah. The biblical holidays offer Christians a great opportunity to learn more about the Jewish background and context of their faith. Supplying these items provides a valuable service to your customers. In addition to increased interest in the biblical holidays in the last few decades, more Bibles and books have been published to explain the identity and life of the Messiah. Meeting the Messiah in His Jewish milieu enables believers to get to know the real Yeshua, not the one who’s often been presented in the last 2,000 years—a blond, blue-eyed Scandinavian. The Jewish New Testament Commentary provides explanations of many ideas, events and stories not readily understood by Bible readers who don’t know about the Jewish aspects of the Messiah and His talmidim (disciples). In addition to this commentary that provides an overview of the New Testament (Brit Hadashah), other commentaries go even deeper in helping the reader understand the Bible. Recently, commentaries on James (Ya’akov), Jude (Y’hudah), Ephesians, Matthew and Acts have been published and could be displayed on a shelf dedicated to Messianic commentaries or grouped in a Messianic Jewish section, which would include similar books. Because Israel is so central in the news today, new books have been published to explain the situation in the Middle East. Never before in history has the world’s attention, especially from Christians, been more on Israel. As we read about Hamas, Hezbollah and ISIS and see the threats these groups are to Jews and Christians, it becomes more important to understand what’s behind their hatred. By growing in their knowledge about Israel, Christians can learn how to “pray for the peace of Jerusalem” (Ps. 122:6). It is clear that God has called the Christian church “for a time such as this” (Esth. 4:14). Without the support of Bible believers, the existential threats Israel faces every day could lead to devastation and destruction. Presenting an array of books that deal with Israel in the last days would help believers know how to pray for Messiah’s country and people. Consider including books on the geography and history of the Holy Land, and add an attractive display of gifts from Israel to further connect customers to the land of the Messiah. Finally, we all know we’re called to be witnesses for the Messiah. Each believer is expected to share the faith. But what many don’t know is that the gospel is to go “to the Jew first, and also to the Greek” (Rom. 1:16). Christians often forget that the Great Commission was given to Jewish followers of Yeshua to take the gospel to the Gentiles (Matt. 28:19-20). They fulfilled their commission and thus the gospel has moved from Jerusalem, Judea and Samaria and now is in the outmost parts of the earth (Acts 1:8). But there is a special commission for Gentile believers, to “provoke the Jews to jealousy” (Rom. 11:11). But how do non-Jews fulfill their commission? They do this by demonstrating an inner peace that passes all understanding and sharing that peace with Jewish people. Toward fulfillment of this commission, retailers could display together a number of books on Jewish evangelism—testimonies, “how to witness to Jews” books and other such resources to help Gentiles accomplish Yeshua’s calling: “I was sent only to the lost sheep of the house of Israel” (Matt. 15:24). I truly believe that when we partner with the Messiah to reach His people, He is pleased. Thankfully, there are many resources to help fulfill this vision. The Christian retail store has an important purpose in the last days, providing educational material for Christians to learn about their “Jewish roots” and evangelistic material to help Jewish people meet their Messiah. Organized in one large section of “Messianic Jewish Publications” or placed throughout the store by type of book—Bibles, commentaries, history and so on—these resources truly count for the kingdom. Barry Rubin is the rabbi of the oldest Messianic Jewish congregation in the world. He is also the president and publisher of Messianic Jewish Communications (messianicjewish.net ).